Image: Photo of Purim mishloach manot basket. Photo by Yoninah via Wikimedia. There are four mitzvot [commandments] for the feast of Purim. Read the Megillah: Read or hear the story. Going to a Purim spiel is better than nothing at all, but ideally Jewish adults will read or hear the megillah itself. It’s short, and public readings are a matchless experience – check with local synagogues for times. Even if you don’t understand the Hebrew, make noise when everyone else does at the name of the villain Haman (ha-MAHN.) A good megillah reading is pure performance art. Attend to listen live if you possibly can. If you have no better options, though, there is a lively Megillah reading on You Tube from Congregation Har Tzeon-Agudat AchimCongregation Har Tzeon-Agudat Achim, a Modern Orthodox congregation in Maryland. Don’t read Hebrew? Follow along with an English translation. You can even do it on your smartphone or tablet – search your app store for “Megillat Esther” or for a regular Tanakh. Be sure to get a Jewish translation – Christian Bible translations are from a different text. Seudat Purim [Eat a festive meal]: Get together with your community, or some friends, and celebrate the survival of the Jewish People. Most synagogues have a festive meal of some kind. We can also fulfill the mitzvah by inviting friends over for a shared meal. Traditionally the meal includes meat and wine. Your mileage may vary, but the food should be a treat of some kind. Matanot L’Evyonim [Gifts to the Poor]: Money, food, drink or even clothing are all appropriate gifts. We are talking about actual presents. We can fulfill this mitzvah by giving money, clean clothes, or good food to individuals. This does NOT mean clean out our closets for a trip to Goodwill. If you don’t want it, it is not a true present! Since one of the customs of Purim is drinking, for one day do not worry about what a poor person is going to do with cash, or heaven forbid give the “gift” with a lecture. A gift to the local food bank is indeed a “gift to the poor” and much better than nothing but it is more in the spirit of the holiday if we perform this mitzvah personally if possible. Mishloach Manot [Gifts to Friends]: We send prepared food or drink to friends to enhance their festive meal. The food should not require further preparation, and there should be at least two portions. A gift of clothing or money does not fulfill the mitzvah. Normally it is better to do a mitzvah in person than to send it by messenger but since the Book of Esther mentions “sending” gifts, on this holiday the custom is to send by messenger. For a more complete discussion of these mitzvot I recommend the article Purim and Its Mitzvot on the Orthodox Union website. Image: Three Jews celebrating Purim: a Cubs fan, a very silly rabbi, and a cowboy. Photo by Linda Burnett. At last! Rosh Chodesh Adar Bet arrives at sundown on Thursday, March 7, 2019! In a leap year, Adar Aleph is the “added in” month, so we have to wait a little longer for Purim. Purim this year (2019) will begin at sundown on Wednesday, March 20, aka 14 Adar Bet, 5779. 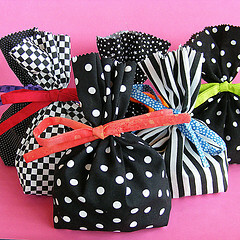 Plan our mishloach manot, gifts of food for friends, aka Purim goody bags. Plan where we will hear the megillah [Scroll of Esther] If you want to hear the whole scroll chanted, it is wise to phone ahead. Some synagogues have only a Purim shpiel. Also, while officially we don’t begin preparation for Passover until after Purim, in reality many Jews begin the Passover prep before they put on their masks. If you want to start thinking about that process, I recommend taking a look at Cleaning for Passover: Begin in Egypt. It’s a guide especially for those who have never kept Passover before, or who find the prospect of cleaning for Passover overwhelming. 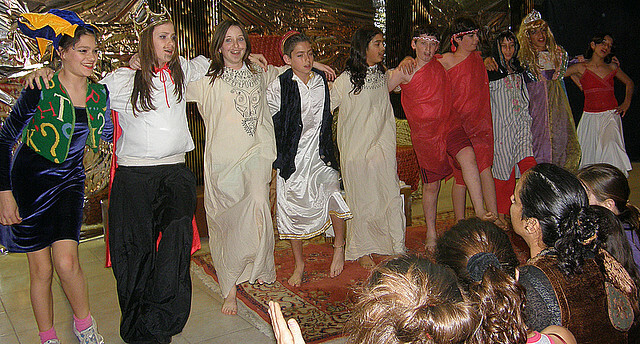 Shake off those winter blues, and get ready: Purim’s coming! Posted on March 8, 2016 March 6, 2019 Categories PurimTags Megillah, mishloach manot, Tzedakah1 Comment on Purim’s Coming! Mishloach Manot: A Delicious Mitzvah! Ask most American Jews about Purim and they will mention children’s parties, silly Purim Shpiels, costumes, and masks. They may tell you the story of Queen Esther. They might tell you about drinking alcohol in quantities not seen on any other holiday. They are less likely to mention one of the sweetest customs of the day: mishloach manot. (meesh-LOW-ach mah-NOTE) This is the mitzvah of wrapping up small gifts of food or drink to give to family and friends. If the Hebrew name is a tongue twister, call them Purim Goody Bags. While it is a commonly observed mitzvah in some places, I had never seen it in my home congregation in Oakland. My first experience with mishloach manot was when one of my teachers at Hebrew Union College, Dr. Rachel Adler, showed up at class with a shopping bag loaded with a small brown paper bag for each student in her classes. Mine had a tiny bottle of kosher grape juice and 2 cookies. I was thrilled, then immediately felt guilty that I hadn’t brought her a goody bag, too. The gifts must be food, not money. They must be delivered during the day of Purim. They are given in addition to a special gift to feed the hungry, not instead of it, and one should not buy the gifts with money from one’s tzedakah (charity) budget. And despite my initial guilt feelings over Dr. Adler’s generosity, mishloach manot do not require a reciprocal gift. The minimum to fulfill the mitzvah is a package of two prepared food items to one person. “Package” is a flexible term: I have seen fancy gift baskets of food for sale for Purim in Israel, but I have never received a sweeter mishloach manot package than the little brown bags Dr. Adler passed out to us with cookies and juice. One hectic year I used foil to make shiny little packages with wrapped candies inside. Mara Strom has written a charming article with 101 ideas for mishloach manot on a budget. The idea is generosity and delight, not ostentation or excess. There are four main mitzvot of Purim: The Reading of the Megillah, Eating a Festive Meal, Giving Gifts to the Poor, and Mishloach Manot. Which of these mitzvot have you done in the past? Which might you like to try this year? Posted on February 24, 2015 February 24, 2015 Categories PurimTags mishloach manot, Purim, Purim mitzvot18 Comments on Mishloach Manot: A Delicious Mitzvah! Purim costumes are usually very informal. 3. MITZVAH 1 – HEAR THE STORY. We are commanded to hear the megillah read every year. We fulfill that mitzvah either by listening as someone chants the scroll or by seeing it acted out in a Purim Shpiel, with lots of audience participation. It is traditional to drown out the name of the villain, Haman, with noisemakers like groggers or with boos. The booing and noise is what may shock newcomers to synagogue: for many Jews, this is an opportunity to really let out our feelings about the people who have tried to kill Jews. 4. MITZVAH 2 – FESTIVE BANQUET. We are commanded to enjoy a festive meal on Purim. One theme for the holiday is feasting – if you read the story, you’ll notice there are lots of parties in it. Hamentaschen are three-cornered filled cookies associated with the holiday. Holiday cookies and foods are a great way to use up flour and other chametz in the pantry. Remember, Passover is one month after Purim, so the baking for Purim can be the beginning of Passover prep. 5. MITZVAH 3 – GIFTS TO POOR PEOPLE. We are commanded to see to it than even the poorest people can enjoy a festive meal. A donation to the Food Bank in your area or to a Jewish organization such as MAZON works nicely. 6. MITZVAH 4 – MISHLOACH MANOT (Meesh-LOW-ach man-OHT) are small gifts of baked goods, wine, or other goodies, sent to friends to enhance their feasting. Ideally we send friends a little package including two or three treats. 8. DRINKING. There is a tradition that one should drink “until one cannot tell Haman from Mordechai” – the bad guy from the good guy. This, too, is a theme from the story but it has too often been taken to excess. Don’t drink and then drive home from synagogue, or push alcohol on anyone, please. Don’t give alcohol to children. Purim is supposed to be a fun holiday, and overdoing the slivovitz can take all the fun right out of it. Immediately after Purim, we begin our Passover preparations. Passover is only a month away!